The people in Battleborn are wounded yet compassionate, despairing and lonely, but always open to a hug, a kiss, a way out, a way in, or a fleeting moment of companionship. These aren’t characters in stories, but human beings perpetually yearning for warmth. Fortunately, this book contains many stories because I read them for days. 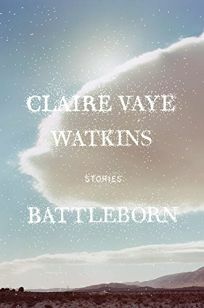 Claire Vaye Watkins has apparently sprung fully formed into the narrow pantheon of young writers willing to take narrative risks, eschewing trend and style for depth and wisdom. Entering the varied lives is akin to watching a tightrope walker high overhead, moving with steady confidence without a net. I found no missteps, no wobbles, no hesitations. As every story ended, I exhaled a long breath I didn’t know I’d been holding. Watkins writes with precision and care, the sentences themselves as surprising as the events, the dialogue, and the spare description. On a purely formal level, these stories shatter the forward motion of time. They move easily and readily from the present to the past and even to the near future. For lack of a better term, there is a purity to the prose that is a constant pleasure to read. Watkins makes beautiful art by embracing the rigors of the short story form, considered the most difficult in literature, then tossing out the rules and inventing some of her own. She blends history and fact with fiction to create a new mythology of the American West—the untold stories of people seeking connection with the past, the land, and each other. There is great originality in these narratives. I was deeply moved by the core of emotion within each story. The settings are fresh—desert, brothel, ghost town, casino, a series of letters. But the generosity and personal sacrifices of the people are as universal as the stars at night. Chris Offutt is the author, most recently, of No Heroes: A Memoir of Coming Home. He lives in Mississippi.